Recently the Outlook magazine came out with the feature article on inculturation attempts of the Christian denominations in Tamil Nadu particularly by the Catholic Church. “This has emanated from the popular devotion of the faithful”, the article quoted Joe Varghese, a Catholic priest of a famous church of Marian cult in Chennai. Many theologians featured in the article presented the inculturation-evangelical project as “cultural inclusiveness”. Are they merely a spontaneous expression of popular devotion and cultural inclusiveness as claimed by the Christian evangelists or is there more to it than what meets the eye? Let us start from the article itself. In the article, the Christian appropriation of the name “Periyanayagi” by Constanzo Besci, an eighteenth century Catholic missionary in Tamil Nadu, is explained by a Catholic theologian as “cultural inclusiveness”. In Tamil Hindu tradition, Periyanayagi is the name of the consort of Shiva. She is a goddess in her own right and is part and parcel of the vital aspect of Shiva. She is primordial and independently divine. She is Brahman. On the other hand, Mary in Christian theology is not even part of the Holy Trinity. She is only a saint—a rank well below the male deity in Christianity. Saints in Christian theology are sort of divine brokers between the devotee and the Christian deity seeking the mercy of the deity for the devout. Thus, when the Catholic Church allows the use of the name of a Hindu goddess for Mary, it not only appropriates the name of the deity but also downgrades the name in view of the Christian theological context. It is not inclusive culture. It is theology of aggressive spiritual deceit. The pattern can be seen continuously in all Christian manoeuvres of the inculturation process and it has a long history. It was the Hindu scholar Sita Ram Goel (1921-2003) who made the first major and systematic study of this Christian phenomenon when he published in 1988 the book Catholic Ashrams. In 1994, an enlarged edition came out. Goel had collected the letters from the promoters and proponents of the inculturation projects as well as its critics—particularly Swami Devananda and Ram Swaroop from the Hindu side and Wayne Teasdale and Fr Bede Griffiths from the other side. This work so far remains the best documented work from the Hindu side on this movement. With the inculturation movement today steadily acquiring a popular and theo-political colour it is time we look deep into the theology that forms the basis of the inculturation movement—particularly in Tamil Nadu. Monchanin and Henri Le Saux now gave themselves Hindu names. Monchanin became Swami Parama Arubi Anandam (ultimate, formless happiness) and Henri Le Saux, Swami Abhishiktananda (bliss of the anointed one). At this point Monchanin makes an important distinction: Yoga does not pertain to the essence of Indian civilization but to its form…. Yoga as a ‘method’ not ‘doctrine’ as ‘form-manifestation’ not ‘essence’ would seem to guarantee considerable freedom in a Christian theologian’s assessment of the Yoga component in the various Indian schools, while also guaranteeing a Christian contemplative’s use of yogic forms of meditation. In spite of this accumulation of obstacles, the need remains urgent: if Yoga is not Christianized, an essential aspect of India … will forever remain outside the pleroma of the Mystical Body. As the inculturation project progressed, important differences started emerging between him and his collaborator Henri Le Saux. The latter wanted to extend Christianising to Advaitic experience also. Towards this end Henri Le Saux took extensive tours to Hindu places of pilgrimage and started practising meditation. Monchanin strongly disapproved of this and warned against going to Rishikesh, which he said was “a place where sadhus, real or supposedly so (both kinds no doubt) devote themselves to delusive exercises verging on mirage”. It seems to me more and more doubtful that the essence of Christianity can be found by going through Advaita (the non-dualism of Sankara). Advaita like yoga and more than yoga is an abyss. Whoever dizzily plunges into it cannot know what he will find in its depths. I fear it may be himself rather than the living triune God. In later years Abhishiktananda (Henri Le Saux’s Indian alias) himself referred to Monchanin’s skepticism about any reconciliation of Christianity and Vedanta and spoke of Monchanin’s fear that his Christian faith might be overwhelmed by Vedanta as it had nearly been earlier by Greek rationalism. Some hard words on these subjects were exchanged at Shantivanam but their mutual respect and deep affection withstood the strain imposed by these disagreements. In 1957 Monchanin died and Henri Le Saux took over the “ashram”. Even the burial structure over his dead body serves his mission of appropriation. One finds here a verse from Manikkavacagar a ninth century Saivaite mystic poet and one of the four seers venerated by Tamil Saivism. The verse written on the grave of Monchanin is the verse in which Manikkavacagar speaks of the greatness of Shiva coming as his own guru. The verse when written over the grave of a Christian priest evokes two ambiguous meanings both of which belittle the original Saivaite context. If one is to take the verse to mean Monchanin himself (by his disciples) then that is a downgrading statement on Shiva to a Christian missionary. If the statement is made as a reference to Jesus then again there is a problem. In Saivism, Siva comes in human form when the disciple has obtained a critical mass of inner preparedness. This human form in which Shiva appears is according to Saivism, is neither an avatar nor does it have a human birth. It is only a form that appears, initiates the disciple and disappears. Hence if the statement of Manikkavacagar is applied to Jesus then it is an intentional distortion of the original verse. One can note that in the letter Griffiths tactfully accepted that Monchanin was indulging in deception. And also one can see that the supposed distancing from the deception of Monchanin was attributed by Griffiths, not to any ethical change of heart but rather changes in the establishment of the Church. Even this statement by Griffiths is not completely true. The mission of Monchanin still remains very much integral to and is at the heart of Shantivanam movement as evidenced by the fact that the Golden String, the bulletin of the Bede Griffiths Trust in its winter 1997-8 issue hailed Monchanin’s quote to “grasp the authentic Hindu search for God in order to Christianize it” as “prophetic”. Today, the strategy of “Christianisation” of yoga has become even stronger. The seemingly paradoxical stand of Monchanin in outlining the “perils” of yoga while at the same time taking efforts to Christianise it is reflected in the stand taken by the Church at large in India today. Catholic educational institutions do have their own form of yoga curriculum in their schools and campuses. At the same time they oppose any attempt by Indian Government to bring yoga into the school curriculum. When the present government announced the draft for the National Education Policy in 2016, there was a protest led by Bishop of Coimbatore Diocese L. Thomas Aquinas, Superintendent of Roman Catholic Schools, Coimbatore Diocese, A. Maria Joseph and other high officials of the Catholic Church, teachers, non-teaching staff and members of the management of Christian-run education institutions in and around Coimbatore. Among other things the Catholic priests protested against “promoting yoga”, which they declared “was not a panacea for all ills”. The Catholic Bishops Conference of India (CBCI) in its “report of the national education consultation” held on 24 and 25 October 2017 in New Delhi, announced that introduction of yoga as also part of “gradual saffronisation”. Catholic missionary J. Monchanin (1895-1957) had established the “Saccidananda Ashram” in 1950 and had started an elaborate mission to “Christianise” Hindu spirituality. He wanted Hinduism to die, shed Vedanta and get resurrected in Christianity. In 1957, he died and was succeeded by another French Catholic missionary Henri Le Saux (1910-1973). Henri Le Saux assumed the Hindu name “Swami” Abhishiktananda as part of his mission strategy. By 1955, he was grooming a young Christian boy of 20 years to become a Christian Ramana, which however could not materialise (James Stuart, p.79). In 1957, following the death of Monchanin, Henri Le Saux then in charge of Shantivanam, soon developed the “fulfillment theology” to “Christianise” Advaitic experience. The “fulfillment theology” was one of the prominent and strong weapons in the theological arsenal of Christianity. The Vedanta is not Christian and never will be—simply as Vedanta: but very definite preparation for it…. It is our belief that the living Christ will sanctify and make complete the religious thought of India. In the 1920s, Johanns was publishing a periodical entitled The Light of the East where he serialised articles under the title “To Christ through the Vedanta” over a period of 20 years. According to Harry Oldmeadow, the biographer of Henri Le Saux, “fulfillment theology” had an abiding presence in the work of both Monchanin and Henri Le Saux. There is nothing true, beautiful or good that does not bear the mark of the Spirit. Evil only emerges when what is true, beautiful or good stops short at itself claiming to be the All, the final plenitude, and refuses the role in the history of salvation which is the very purpose of its creation. This was the temptation of the cherub in the Garden of Eden. In his worldview, the spiritual traditions outside the Church exist only because God conserves them for the Christian to bring them into the Church. After a spiritual tradition is appropriated by the Church it ceases the need to exist outside the Church. Unlike Monchanin who worked mostly within the confines of Shantivanam, Henri Le Saux took the appropriation crusade right into Hindu holy places. He always made it a point to go to the most venerated places of Hindus and conduct a Christian mass while unsuspecting Hindus would take the saffron clad missionary for a Western Hindu sannyasin. Later a three-headed Jesus would adorn the entrance of his Catholic monastery at Shantivanam [see image at top of this article]. He now started fashioning his masses based on fulfillment theology. Christmas eve celebrations of 1965 started with the reading of Hindu texts followed by the prophets and then Christian Gospel—thus Hindu texts becoming the preparation for the advent of Christianity. He called mantras as short prayer phrases which could be related to Christian devotion. In his work Prayer he drew parallels between the Hindu Om and Sacchidananda and the Christian Abba, the prayer of Jesus. The mechanism for creating a Christian mantra, which Henri Le Saux called as “mantra sandwich” was later consolidated in Shantivanam. Here a traditional Indic mantra venerated and practised for thousands of years like Om Nama Sivaya or Om Namo Bhagavathe Vasudevaya or Om Mani Padme Hum are taken. Then the Hindu or Buddhist spiritual principle (deity’s name or symbol) is removed and Christian name is slipped in between. In 1968, Henri Le Saux left Shantivanam handing over the charge to new occupants. On parting, he gave a four-fold advice to a Jesuit priest who had founded a Christian centre for dialogue with Hindus. In that advice, Henri Le Saux suggested that Christians should take up the celebration of Hindu festivals such as Deepavali as a joyful expression of their own faith and also use aarti or deepa puja in Christian churches giving it their own Christian interpretation. Suddenly a “folk” Christianity has exploded prominently in the public conscience of Tamil Nadu. It is claimed that it is a spontaneous movement of the people who are expressing their Christian devotion through local cultural forms. However, an investigation shows that it is more a result of a well-prepared strategy that goes back decades in the past. The Church has been working silently and very systematically in creating these Hindu-like “folk” expressions. In Tamil Nadu, it started with a French Catholic priest Jules Monchanin (1895-1957), who wanted to “kill” Hinduism while appropriating the key Hindu elements into Christianity. He had observed that the more a Hindu becomes spiritual the more it becomes impossible to convert him to Christianity. He founded the “Saccidananda Ashram”, which is actually a Benedictine monastery. After his death, Henri Le Saux (1910-1973) took over the institution. He undertook fieldwork by visiting Hindu holy places and conducting clandestine Christian masses in the sacred spaces of Hindus. He wanted to create what he called “Christian Advaita”; he even had a project for creating a “Catholic Ramana”. However, before his death he started criticising the exclusive nature of the Church and even questioned the necessity of Jesus for a real spiritual pursuit. Nevertheless, he produced some of the most important manuals for appropriation of Hindu culture and dilution of its spirituality. After his death, the appropriation project was taken over by his successor Bede Griffiths. The “guru” was finding the “Indian” nature of his “disciple” unpredictable. (“Like all Indians he needs watching—you never quite know what they will do next!”) Nevertheless, he was very happy that the “disciple” was “very faithful to us” and “had taken a private vow of obedience”. However, soon Griffiths discovered Stephen‘s behaviour not very satisfactory. So the “guru” blamed the disciple in a letter—it was of course Hinduism which had to be blamed. As one can see the shallow stereotyped analysis of defects in a human individual as a result of the unconscious forces of his culture and reducing the sacred in another culture to “deeper forces of unconscious”, have all been done already by Griffiths. So when a Wendy Doniger or a Paul Courtright does similar “analysis” of Hinduism, what is essentially being carried out, intentionally or unknowingly, is a crypto-colonial project which embeds in its core theo-racism. Griffiths also decided to use one important aspect of Hinduism as an evangelical tool—its universal inclusiveness. So what is useful and valid for evangelism in Hindu mindset, when it accepts Jesus as divine similar to an avatar, becomes “fundamentally false” and “fundamentally perverted” when a Christian / Western author tries to place Christianity “on a level” with other religions! What is important is that these theological studies are not abstract entities residing only in the papers. They get translated into concrete evangelical entities. Fritjof Schunon to Gandhi bhajan, the Hindu universalism becomes a doorway to proclaim Christian exclusiveness. In the same book he also makes it clear that Shiva is nothing more than “shadow of the mystery of Christ” (p.100). Griffiths often descended into an attack on the Hindu deities declaring that they were ‘attractive’ but not ‘good’ and that they lacked morality. The depiction of Hinduism as nothing but the unconscious or the “dark” or “negative” (as deemed by the Christian values) forces of the unconscious is so pervasive in the works of Griffiths. Today, they are very familiar in the Western academic circles studying Hinduism—particularly in Wendy Doniger-Jeffrey Kripal school. Doniger-Kripal school of course does not speak of Jesus but in the place of Jesus they place the superior Western academic discourse, which, of course, always has been unwittingly an aid for evangelism during both colonial centuries and post-colonial decades. One wonders if his attacks on Sri Krishna and Shiva as well as his stereotyping of Hindus and India as lacking moral sense, being dishonest, etc. were more the amalgamation of his own repressed sexuality combined with the colonial theology. He wrote that he was starved of the feminine. Was his conversion attempts then elaborate predatory rituals on the nation and culture perceived as the feminine prey? In fact in the current context one has to ask if these innate tendencies of Catholic Church are what making the priests turn predatory paedophiles on their own flock? Is it time for Hindus to reverse the direction and do a fulfillment mission on Christianity? Perhaps what Christianity needs is the replacement of a crucified Christ by a dancing Siva or a Krishna whose melody can redeem the Church of its repressed sexuality? Despite Griffiths and his acolytes claiming that the so-called “Christian Advaita” was deeper than Sankara’s Advaita, Cyprian Consiglio, another Catholic theologian, found him saying in his previous interviews that Griffiths thought Abhishiktananda “went too far”. To achieve this, he recruited Rupert Sheldrake—a British biologist advocating questionable pseudo-scientific vitalist theories—who also shared the colonial prejudices of Griffiths including the negative stereotyping of Indic traditions as fatalistic and uncaring towards human suffering. In hindsight, the historical irony is cruel. In reality, it was a British Christian Winston Churchill who engineered one of the severest famines of that century in Bengal and countless people perished in the streets of Calcutta because of the inhuman Hindu-phobic attitude of Churchill to which his Christian upbringing also contributed in no small amount. It was Hindu nationalist Syama Prasad Mukherjee and Hindu volunteers who fought against the famine created by the British. The subsequent post-independent Calcutta scenario too was more because of the colonial impoverishment rather than the stereotyped Hindu apathy. While Griffiths was not primarily interested in Aryan-Dravidian race theory, he did use them in his approach to Hinduism. And where he used them, he tried to show Hinduism as an Aryan development that integrated into itself a positive element of non-Aryan tribal tradition. Again one can see here the framework that would also be used by David Gordon White—studying tantra through the Brahmin-non-Brahmin ethnic binary. One can find many icons of Mary clad in Indian dress placed in many areas at Shantivanam. The chapel entrance tower displays a Mary similar to a Hindu goddess donning a vermillion mark and performing abhaya hasta, seated below Jesus. Today, we find in select areas of Tamil Nadu such promotion of Indianised form of Mary—specifically to compete with and replace Mariamman—the mother goddess of the folk tradition, who was popularised during the freedom struggle by Tamil poet Subramania Bharathi. After strategically promoting such designed syncretism, the missionary scholars enter, do research and proclaim that there are similarities between worship of Mary and Mariamman. For example, in the book Christian Folk Traditions: An introductory study published from the Bishop House, Nagercoil, in 2007, Brigitte Sebastia had a paper “Maariyamman—Mariyamman: Catholic Practices and Image of Virgin in Velankanni”. Shantivanam chapel itself is built in the style of Hindu symbols. For example, generally, Hindu temples of South India have in the four corners of the gopuram, an animal, which is the mount of the deity. In the case of goddess it is lion and in the case of Shiva it is the bull. The Shantivanam chapel features very similar bull, lion, eagle and they actually represent the evangelists Luke, Mark and John. Those recognised by the Catholic Church as officially saints are shown in the base tier of the gopuram—in Hindu saffron clothing—like mendicants or siddhas and above them Jesus is depicted in yogic postures. In Shiva temples usually on the southern side of the gopuram, Shiva is depicted as Dakshinamurthi. 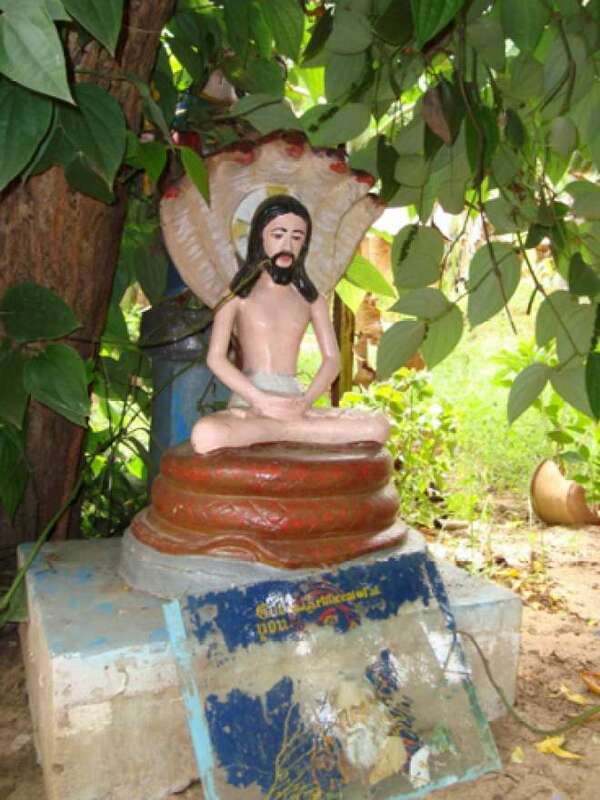 In the Shantivanam chapel, Jesus is depicted as Dakshinamurthi. In the “evangelical manual” given to evangelical workers in Tamil Nadu, question number 193 is about Nataraja. The explanation given is that it in reality symbolises Jesus winning over death but the book claims that these meanings were distorted by the Aryan Brahmins. Today, many such texts which claim India to be “a Christian nation” and provide evangelical guidelines based on inculturation and appropriation are available throughout Tamil Nadu in many Christian stores. These books are approved by Roman Catholic Diocese officials. Inside Shantivanam, one finds thus various forms of Jesus at experimental stage. These forms imitate popular Hindu sacred icons. Jesus sitting in the lotus position like a yogi with four forms of him sitting adjacent to each other in four directions looks typically Hindu. The aim is to increase the Hindu universal acceptance to a point where he or she will accept the Trojan of Jesus-exclusiveness presented in Indian garb. There is a statue of Jesus in yoga pose under a five-headed serpent. Given the fact that Tamil Nadu waysides and the banks of village water bodies abound in the images of Hindu gods and goddesses seated under such five-headed serpents, eventual installation of such theo-plagiarised Christian statues can create considerable confusion in the minds of people while at the same time fulfilling the mission of the Shantivanam founders to replace the Hindu deities with the Christian deity at the centre of Hindu spiritual traditions. They are at the experimental stage—waiting for the right time of launch—for Christianising Hindu institutions and spiritual traditions. The Shantivanam movement finds parallel for this kind of operation in the history of the Church—when it captured the [ancient Greek and Roman] pagan religious institutions, their celebrations and places of worship. When St. Gregory the Great sent the monk Augustine to the Angles, he directed him not to deprive them of their places of worship or customary festivities, but to transform their temples into Christian ones and to dedicate to the Saints their religious festivals. The Indian Church at least in the Tamil Nadu made at times wonderful use of these directives…. In short Shantivanam was only an attempt amongst others an effort to recapture a spirit and to prepare this spirit to find in due time its right outcome and Christian expression, in matters of cult, art, etc. Today, the experiments done in the quite obscure corners of Tamil Nadu are being tested openly by the Church. For example, John Samule, a Christian zealot and director of Institute of Asian Studies spearheaded the “Murugan conferences”. He emphasised that his approach was more to approach Murugan as a historical figure than a deity. Though Saivism categorically states that Murugan has no human birth, this thesis was first put forward in the Murugan conferences. Later, Seeman, a Christian born Tamil secessionist started vociferously stating that Murugan was just a deified ancestor of Tamils. Soon, St Thomas, who in a historically unattested story [was said to have been] martyred in Madras, was presented by the Church similar to Murugan with his spear, and his forehead adorned with holy ashes and vermillion in Hindu fashion. » Aravindan Neelakandan is an economist, psychologist, author and contributing editor at Swarajya magazine. He is best known for the book Breaking India which he co-authored with Rajiv Malhotra.